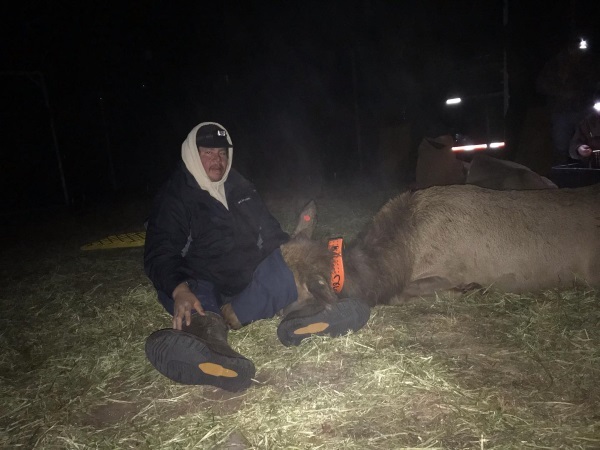 Late into the evening Sunday, January 13, Ho-Chunk Nation’s Department of Natural Resources Wildlife Biologists were on standby when they received a call from the Wisconsin DNR confirming 5 elk were trapped and ready to be sedated and collared. According to Wildlife Biologist Nelson Smith of the Ho-Chunk Nation DNR, biologists from the Wisconsin DNR had set a trap earlier in the week designated for a specific herd of elk. The trap is made up of connecting panels that reach 10 feet in height. Once it is set up it looks similar to an oversized corral which farmers use to hold their cattle. “There are cameras inside and the DNR biologist can see on his computer what animals are inside, and when the biologist gets the animals he wants, then he can trigger to close a door from his computer,” Smith said. After the elk were trapped, they were sedated and collared. Ho-Chunk Nation DNR Director Greg Blackdeer comments on the importance of collaring the elk. “We’ll know where they are at, we’ll know when they die and we’ll know if they get shot,” he said. “The end goal is to track the elk, so we can have a thriving population in the area,” Blackdeer said.